Only 14.2% of the top five leadership positions at the companies in the S&P 500 are held by women, according to a CNNMoney analysis. "It's kind of shocking really. With all of the attention the issue gets, you'd think companies would be doing better," said Rita McGrath, a professor at Columbia Business School. In recent years, there have been a number of high-profile female CEO hires, including Lockheed Martin (LMT) CEO Marillyn Hewson and General Motors (GM) CEO Mary Barra, the first woman to ever lead a major auto maker. That's why CNNMoney analyzed the next four executive positions -- chief financial officers, chief operating officers and other key roles at major companies. 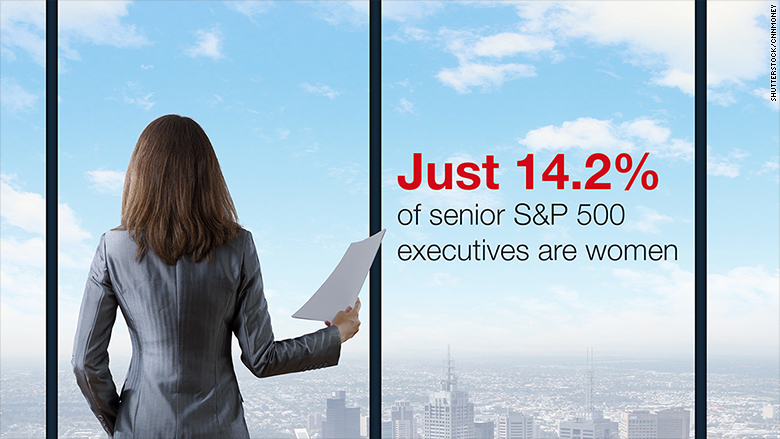 Women hold 16.5% of these four positions just below CEO in the S&P 500. Yet that's still a small pool of leaders to draw from. "If you don't have women in the pipeline, they are not going to get the top job," McGrath said. The number of women running S&P 500 companies will actually fall to 23 in April when Maggie Wilderotter steps down after nearly a decade atop Frontier Communications (FTR). "We didn't get to these jobs without being fearless and courageous at the same time as being good at what we do," she said. "When we close our eyes and picture what a CEO looks like, too often the picture that comes to mind is that of a white man," said Deborah Gillis, CEO of Catalyst, a nonprofit pushing to improve corporate gender diversity. "It doesn't just mean being a mentor. Sponsorship means you are really fighting for that person," said McGrath. See for yourself: How many women are in the C-suite? 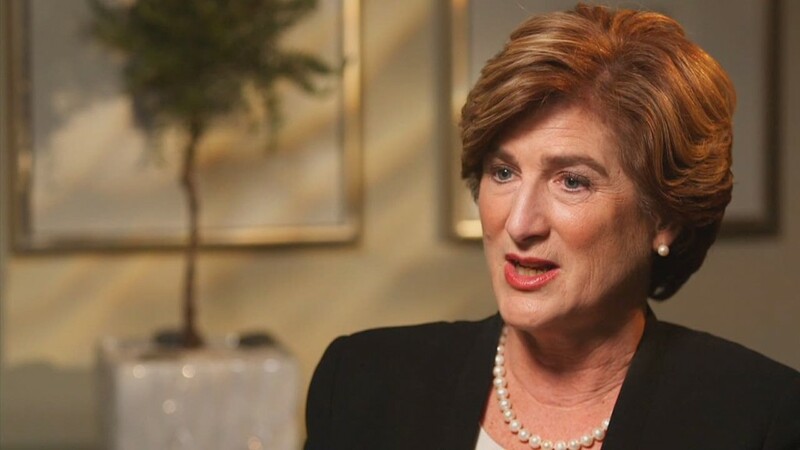 "We need to give women more full P&L experience and the task of managing brands -- the nuts and bolts of the corporations," Denise Morrison, CEO of Campbell Soup, told CNNMoney. Morrison, the sister of Wilderotter, climbed the corporate ladder at Procter & Gamble (PG) and then Campbell by running brands, learning the supply chain and taking on other operational roles. "It's traditionally and will be for the foreseeable future an all-in enterprise to be a chief executive. It becomes your whole life," said Stewart Friedman, director of the Wharton Work/Life Integration Project. "We are seeing more and more stay-at-home dads, enabling more women to go all-in in their careers," he said. "This is trending in a better direction, and there is a greater focus on development of women, but there is still much work to do -- both at the top management level and in the boardroom," he said. Moreover, the hiring -- and success -- of leading women like Indra Nooyi at Pepsi (PEP) and Phebe Novakovic at General Dynamics (GD) should help shatter the stereotype that only men can hold these top jobs. There seems to be little appetite in the U.S. for compulsory measures like quotas. However, halfway steps like Australia's requirement to very publicly disclose the proportion of women in senior management at public companies could gain support. For women, quotas are a double-edged sword. No one wants to be seen as the token female who only got a role because of a quota, but there's also acknowledgment that the pace of change is too slow. "If I get a job because I'm a woman, it undermines me from the start," said McGrath. "On the other hand, the pace of change if you let things happen organically is absolutely glacial." Sources & methodology: This CNNMoney analysis was based on data provided by Markit listing the top five executive officers listed in each company's regulatory filings. Each company self-selects which roles such as CEO, CFO and COO it considers the top five.